(Piano/Vocal/Guitar Songbook). 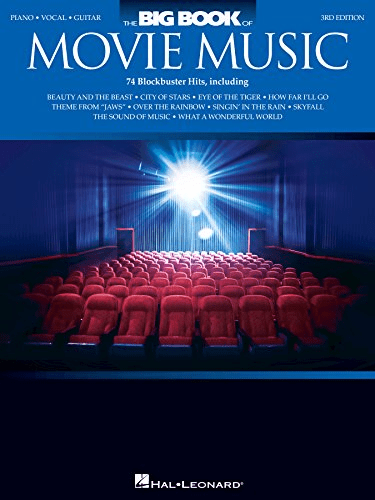 74 blockbuster hits are included in this updated 3rd edition for piano, voice and guitar. Songs include: And All That Jazz * Beauty and the Beast * City of Stars * Eye of the Tiger * Flashdance…What a Feeling * How Far I’ll Go * Theme from “Jaws” * Kokomo * Let It Go * My Heart Will Go on (Love Theme from ‘Titanic’) * Nobody Does It Better * Over the Rainbow * The Rose * Singin’ in the Rain * Skyfall * The Sound of Music * Take My Breath Away (Love Theme) * Unchained Melody * What a Wonderful World * You’ve Got a Friend in Me * and more.